So, what if, instead of thinking about changing your whole life, you just think about adding additional good things. One at a time. Just let your pile of good things grow. I love this time of year! We have the opportunity to pause, reflect and re-evaluate our priorities and purpose in life. With focused attention, we may have discovered new information such as: new habits we want to incorporate; a creative project we want to pursue or something as large as determining our life purpose. Now I’m going to ask one of my favorite questions – what are you going to do with this information? I get it. It can be very daunting to begin. How do I know if it’s the right path? What will people say? What if I fail? Here’s my favorite answer – baby steps. 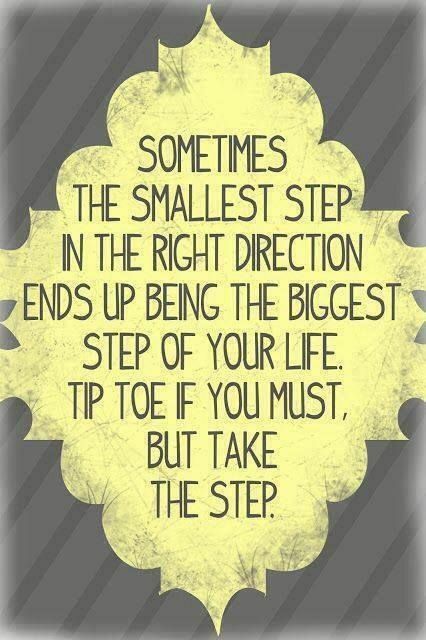 Take tiny, wobbly baby steps towards action. It doesn’t matter how large a step or even how important. It just matters that you start. You don’t even need to have it all figured out. Some of that will happen along the way. The first step depends on your goal. It may be research of your concept; writing a business plan; creating a book proposal… Through these steps, you will clarify your idea to yourself. Then, when you present it to someone else, you will understand the process and can confidently explain it. The most important part of this first step is that you have now claimed the idea – for yourself, to God and the Universe. It is yours as long as you keep moving forward. Something to remember – babies don’t get up and start walking immediately, it takes time to build the muscles and they each learn at their own pace. Be kind to yourself in this process.